The news in recent weeks has been filled with stories of corruption, deception, and all manner of unethical behavior. Last month facts came to light that required officials at some of the world’s top financial institutions to admit to conspiring to manipulate currencies. More recently we learned of the widespread corruption scandal within the governing body of soccer in which top officials were arrested on charges of accepting bribes in the hundreds of millions. One official now stands accused of diverting funds that were intended for earthquake relief in Haiti. These accusations underscore the far more troubling stories about the deplorable conditions of migrant workers building the stadiums and infrastructure that will service the Qatar World Cup – the legitimacy of which is now seriously in question. These two scandals are only the most recent examples that point towards a troubling void in ethical leadership within some our most prized and important institutions. The habits that facilitate this sort of corrupt behavior are sowed early in our development as leaders. Those who have never been trained to identify unethical behavior – or those who lack the courage to confront it – will crumble when thrust into these situations in the real world. As we’ve seen, the world is in desperate need of leaders trained to identify these scenarios and prepared to act courageously when necessary. Our world and society needs ethical leaders. We need men who firmly understand and embrace this concept. This is precisely what we’re doing at Sigma Nu. Our world and society needs ethical leaders. We need men who firmly understand and embrace this concept. That is our Fraternity’s purpose. These recent scandals are examples of why the mission of Sigma Nu is still relevant today and will be for quite some time. We will always need ethical leaders and until that becomes a cornerstone of higher education institutions, we will need organizations expressly devoted to developing those ethical leaders. Especially so when even the Global Economic Forum issued a report in 2014 that listed a lack of values in leadership as one of the top 10 trends facing the world. 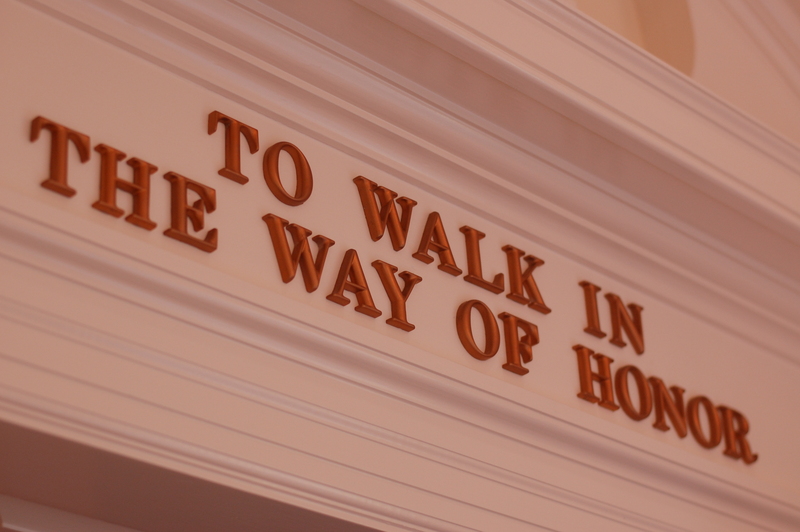 Sigma Nu’s commitment to its mission is not simply through one sentence in a mission statement. It is in our LEAD Program that provides members the tools and knowledge to become ethical leaders. It’s in our College of Chapters program for Commanders that provides keynote speakers on real world experiences of ethical leadership in action. And our commitment to this ideal shines through in the Sigma Nu Educational Foundation that works to ensure our mission can be executed for generations to come. To a large degree, the mission of Sigma Nu frames what we do every day to address the deficit of ethical leaders in our world today. This is why fraternity is just as relevant now as it has ever been in the past. 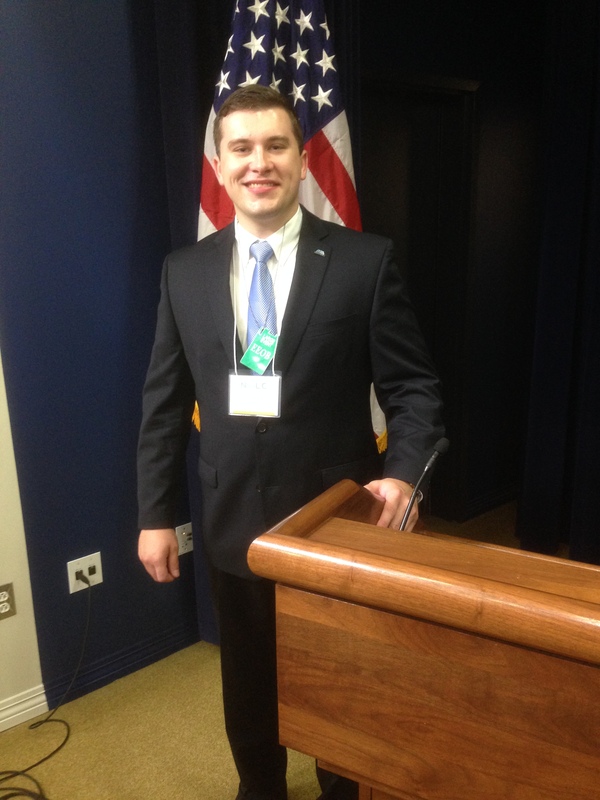 Austin Finley at the White House to discuss Higher Education policy with other student leaders across the country. Sigma Nu has no shortage of student leaders. One such student leader and brother recently went all the way to the White House where he was able to participate in conversations that will influence higher education policy in the coming months. 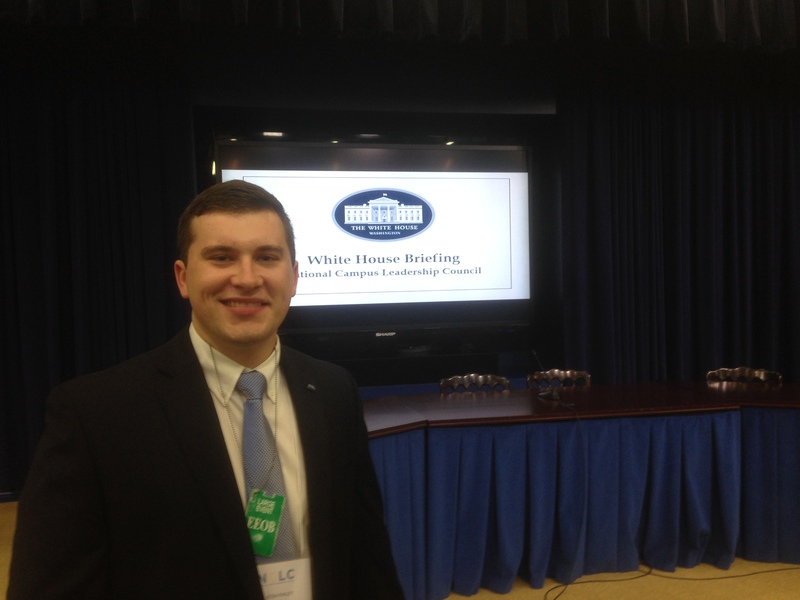 Along with over 150 other student government presidents, Brother Austin Finley (Alabama in Huntsville) spent May 30-June 1 in Washington, D.C., for the National Presidential Leadership Summit hosted by the National Campus Leadership Council (NCLC). As part of Finley’s trip, he got to discuss prominent issues in higher education with fellow student government presidents and education officials within the federal government. The summit featured discussion on many issues that Finley and other campus presidents face including Title IX policy implementation, campus sexual assault prevention, college career readiness, mental health, and college affordability. Along with discussions about issues facing higher education, Finley and his fellow presidents were educated on how to be effective student leaders and implement necessary policies. “What can we do to make our programs more efficient and what are other schools doing that we aren’t doing?” relayed Finley, expressing some of the key focuses of the summit. Among the benefits of the summit was the attendance of many outgoing student government presidents who helped the incoming presidents understand their roles. “We really heard what their struggles were and where we could something different,” said Finley. Finley’s involvement with these high-level discussions, combined with his involvement in local prevention efforts, is emblematic of a much broader commitment by fraternities assuming a leadership role in the growing sexual assault prevention movement. Only a few weeks prior to Finley’s White House invite, Sigma Nu’s General Fraternity joined a consortium of other national fraternities and sororities to launch a new sexual assault prevention program of their own. Brother Finley is eager to get back and shape more higher education policy in Alabama, but he doesn’t want to do it by himself. Finley wants to take his Sigma Nu brothers along for the ride. 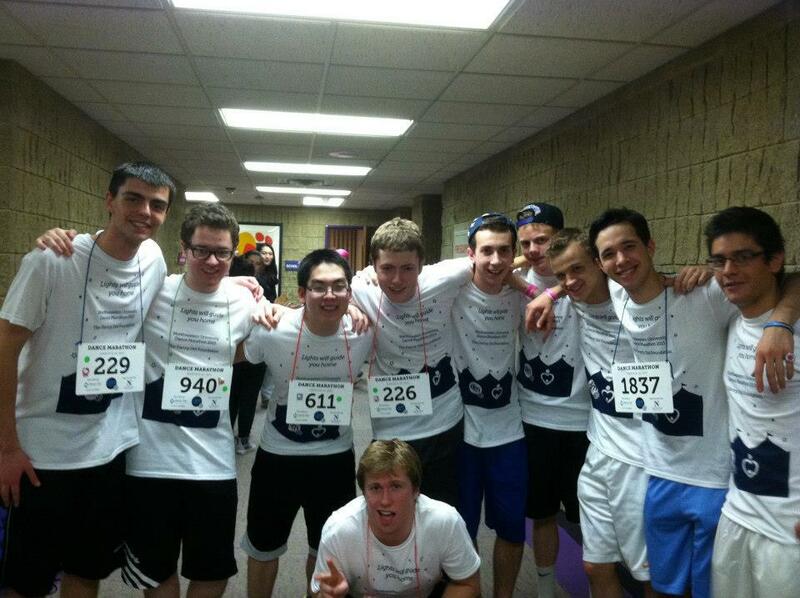 Brothers of Gamma Beta participating in Northwestern’s Dance Marathon in 2013. For many undergraduates, my university tends to feel quite lonely. Students are overly competitive, focused on getting the best internship, job, or graduate school acceptance. Throughout the year, one can find numerous students in the library on weekend nights, working through problem sets or preparing for their next interview. We also have what students call the Sheridan Road Effect, where students walk down the main street on campus with their heads down, and if they notice somebody they have met before, they do their best to pretend like they have not seen them. I am not sure exactly what it is but the campus often feels as if it lacks a true sense of community. I was reminded of this recently when I reached out to professors for letters of recommendation for medical school and received no reply in return. These touching replies further strengthened my belief that my fraternity experience has been the most meaningful part of my college career. Not just for the growth I experienced, but also for the constant support of others. My life today stands in stark contrast to what it was in middle school, or even high school for that matter, and I owe most of this change to my fraternity. The training and education I received from Sigma Nu staff, alumni, and fellow members, coupled with the endless support of my family back home, has put me in a new and better place. Today, despite the anxiety I came to college with, I sit on important committees with university administrators, have a say in school policy changes, help chapter members through difficult experiences, and speak to other presidents about their leadership and personal values. While the true nerd inside me will always have a passion for academics, this work has truly made my time in college fulfilling. In addition to personal growth, my fraternity experience has always brought me a sense of comfort. When someone is in a chapter that operates properly they are never alone, regardless of the campus atmosphere. Sure, it is not uncommon for me to take a weekend night to study for the quarter system’s ceaseless barrage of exams, but I can never go one night without at least ten friends asking about going into the city or offering to study for an exam as a group. Both suggestions are always appreciated, especially the test preparation. Critics of the Greek system point to myriad flaws such as charges of hazing, sexual assault, binge drinking, and drug use. Undeniably, these are serious problems, as they are on NCAA athletic teams, theater groups, club sports, student publication teams, and many, many more places on college campuses. These are issues that need to be addressed and they need to be addressed now. I know this because I hear of occurrences both on my campus and on others. Not only do these problems have no place in Greek organizations but on college campuses in general. If these issues are to be addressed, it comes down to national organizations holding their chapters to the same standards their founders set years ago, and many organizations do that quite well. However, it is also the responsibility of universities to not only hold Greek organizations to high standards of human decency, but to show consistency by holding other student groups and athletic teams to that same high standard. Currently, the Greek system is in a spotlight in a dark room, but if the problem is ever to be truly fixed, the whole room needs to be lit. While there are an unfortunate amount of examples of chapters gone wrong, I know that fraternities still have a place on college campuses because I have seen even more examples of fraternity done right. As the president of the Interfraternity Council, I often talk to administrators about the community service and philanthropy that Greek organizations do. I point to members of my chapter working in hospitals and the Chicago Food Depository, or I point to members canning to raise money for ALS research and forming teams for Dance Marathon. I point to these things because they are easy to understand from the outside. What I cannot fully explain is the real world training and education that fraternities provide through genuine national support and heartfelt relationships with alumni and advisors. Nor, in my case, can I fully describe how meaningful it is when alumni and brothers alike go out of their way to help me, whether that is providing letters of recommendation, reviewing my resume, or simply repeating over and over again that I will become that small town doctor I want to be. When I left for college my freshman year my dad told me that this time was for education, building lifelong friendships, and discovering yourself. That, at its core, is exactly what the fraternity experience is meant to be and what it was for me. Editor’s Note: We invite brothers of all ages to submit essays about their own Sigma Nu experience. Submissions should be emailed to news@sigmanu.org. 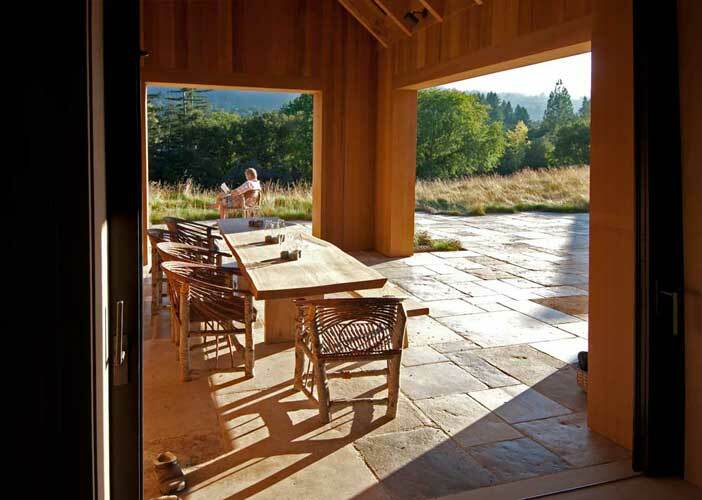 When we last checked in with Paul Holland (James Madison) and his wife, Linda, they were in the process of building the greenest home in America, as chronicled in the Winter 2010 issue of The Delta. 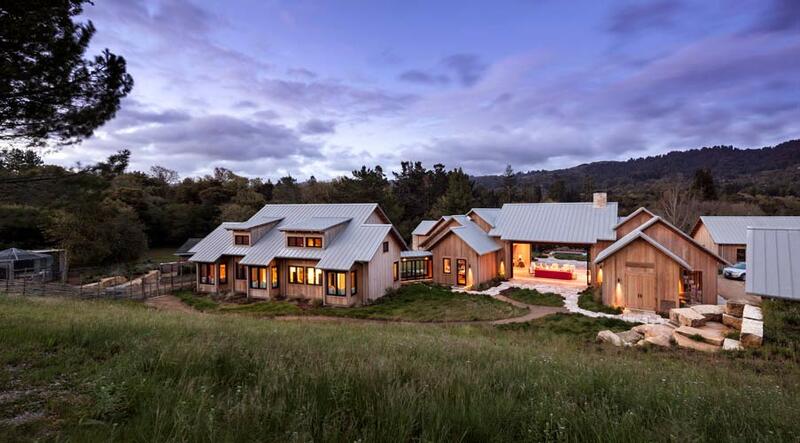 As Paul told us at the time, the project was never intended to be a competition – “the greenest home in America” was more of a personal challenge to see how far they could take it. The real goal was to build an environmentally regenerative concept house that would serve as a learning experience for others looking to learn more about green building. It was always part of Paul and Linda’s plan for the house to serve as a gathering place for not only their family but also green builders looking to learn from the project. In addition to hosting classes from nearby schools, Paul and Linda have hosted nearly 50 groups since moving in four years ago this July. They’ve also hosted classes from several universities, including Stanford and James Madison, Paul’s alma mater. “We wanted a place that brings people together,” he says now, reflecting on the building process. For each group, Paul and Linda walk people through the green elements of the house in such a way that helps visitors learn how to incorporate the same ideas in their own projects. The home is entirely free of fossil fuels, so all mechanical systems are electric. The ground-source heat pumps provide an efficient way to heat the home without electricity. Twenty-seven kilowatts of solar energy power the house and two electric cars; Paul and Linda expect this source to power up to five electric cars when their three children start driving. As for building materials, they were careful to use only wood, stone, glass, and metal. They avoided natural gas and all oil-based products, so you won’t find any paints or varnishes in the house. With the exception of a few trees, they removed all non-native flora from the property, replacing the existing grass with native varieties that don’t require as much water — a decision that has been validated by California’s ongoing water shortage. With the closed-loop recycled water system all water gets treated and reused on site. As the house’s website states, Paul and Linda wanted Tah.Mah.Lah. to be a “proving ground for many innovations in the construction process itself.” As for next steps, they want to continue to do outreach and be a part of the curriculum that educates on green building. Judging from the hundreds of visitors and the green builders who seek them out for advice, it’s apparent that their project is having a positive effect on the burgeoning green building movement. For Earth Day 2015 we asked Paul to highlight some steps we can all take to live a greener lifestyle – whether you’re a green builder or an everyday citizen looking to be more conscientious. Do things that are irreversible. Implement energy systems that use ground-source and solar. Once you get accustomed to not using less efficient sources of energy (e.g. oil-based) you’ll never feel the need to go back. You get hooked on 100% renewable lifestyle. Get in the habit of reusing things. Take your own reusable bottle to the coffee shop when you can. Take reusable grocery bags to the market. Drink tap water in a glass in place of bottled water. Deconstruct existing buildings and donate the parts instead of tearing them down and hauling the parts to a landfill. In general, find ways to cut down on the amount of trash you produce. Take advantage of the shared economy. The most profound thing we’re seeing with regards to more responsible living is the shift towards sharing resources. The current generation of young people is much better at this than older generations. Young people are using UberPool, corporate buses, and other ride sharing services that cut down on traffic pollution. Thanks to Airbnb, people are finding lodging accommodations in existing structures rather than building new hotels. There are now services that let you rent out your car while it’s parked at the airport. The Airbnb for corporate events, PeerSpace, lets groups rent meeting space in existing buildings rather than hotels that don’t get as much use. The sharing economy is providing more efficient use of buildings and automobiles that would otherwise sit idle. Paul predicts that the concepts of home ownership and car ownership will continue to change, a shift that is good news for green living. To learn more about Tah.Mah.Lah and other green causes, visit the project’s website which includes links to news articles and a blog with additional resources for green living. Paul Holland at his office in Menlo Park, Calif.
Sigma Nu: Alpha Xi Delta’s “Alpha” Males? When 10 young women, whom Alpha Xi Delta members now know as their Founders, attended Lombard College in the late 1800s, they were hard-pressed to find activities to keep themselves busy outside of class. The lack of social support was not unique to this Galesburg, Ill., campus. In fact, female students across the country were finding it difficult to locate social opportunities, especially when women were admitted to college and merely tolerated instead of being welcomed as an integral part of the student body. A local sorority called I.C. 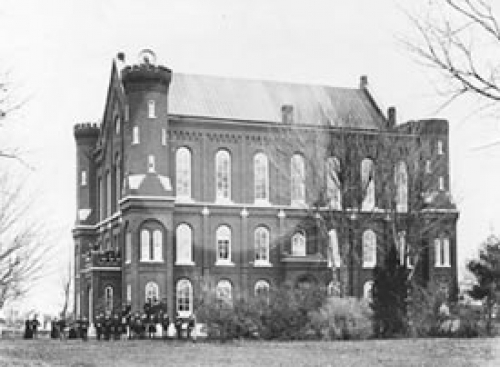 Sorosis, which later became Pi Beta Phi sorority, had been permitted to install a chapter of its organization at Lombard in 1867, which brought the fraternity system to campus and expanded the number of social opportunities for women. This was a good beginning, yet not all of the women at Lombard were interested in, or chosen to become, Pi Phis. Harriet Louella McCollum became a Lombard freshman in 1892, surveyed the social scene and longed for something more. Harriet envisioned a new fraternity that would encourage personal friendships, promote friendlier contacts with the entire student body and actively serve the college. She shared her idea with friends Cora Bollinger, Lucy Gilmer, Eliza Curtis, Frances Cheney and Almira Cheney. In early March, 1893, this fledgling group met to consider the possibility of founding a fraternity that realized these ideals. The women of Pi Beta Phi and the men of Phi Delta Theta, one of the two fraternities on campus, were closely aligned, so the idea of another women’s group was enthusiastically welcomed by our men at the Delta Theta Chapter. In fact, Sigma Nu had been founded at Lombard just a year earlier, so Harriet and her friends eagerly talked with our men about how to establish a new group on campus. Attempts by other groups to organize societies on campus had failed, so the young women made sure their organization was running smoothly before it was officially unveiled to the student body. On April 17, 1893, the group of 10, which now included Bertha Cook, Julia Foster, Lewie Strong and Alice Bartlett, met a few minutes before chapel time to pin on knots of double blue ribbon and long-stemmed pink roses, which had been smuggled into the room. With sparkling eyes, flushed cheeks and proud postures, the women entered the chapel after the faculty and students had been seated and sat quietly near the back of the room. After a moment of startled silence, our Delta Theta Chapter members led congratulatory applause, welcoming Alpha Xi Delta to campus. Sigma Nu members wanted to do something nice for our new Greek sisters to mark this special occasion, so two of our brothers outraced two Phi Delta Thetas by five minutes to buy the remaining box seats for a performance of Othello, which was being presented at the auditorium on April 25. The Lombard Alpha Xi Deltas became increasingly interested in becoming a national fraternity and sharing their organization with women on other campuses. The women realized that expanding Alpha Xi Delta beyond Lombard would require a constitution instead of the few simple rules they had been using to function on a local level. Chapter member Edna Epperson asked her father who, among his attorney friends, could be trusted to keep their plans confidential and help draft a nationalization plan and a preliminary constitution. He referred her to James J. Welsh, a Sigma Nu alumnus from Lombard. On April 17, 1902, their Alpha Chapter celebrated Founders’ Day by adopting the constitution that declared the organization a national fraternity. And, that constitution, with amendments, still guides their fraternity today. Albert H. “Bert” Wilson, an iconic Sigma Nu alumnus from our Beta Iota Chapter at Mount Union College in Ohio, was gifted at (among other things) helping local fraternities and sororities affiliate with national organizations. 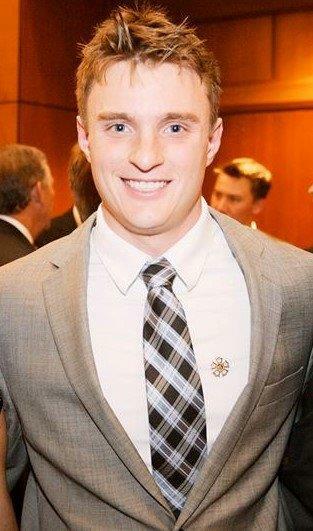 Therefore, and not surprisingly, he was instrumental in helping broaden Alpha Xi Delta’s reach. Brother Wilson began his association with Alpha Xi Delta in 1902 when the S.L.C. Club at Mount Union petitioned for a charter to become Gamma Chapter of Alpha Xi Delta. Brother Wilson and Mary Emily Kay, a member of S.L.C. Club, sat on her front porch and helped write that successful petition. Mary was initiated into Gamma Chapter in 1902 and became Alpha Xi Delta’s fourth Grand President (now known as National President) in 1909. Throughout the years, Alpha Xi Delta and Sigma Nu continued to establish chapters across the country, often finding themselves at the same colleges and universities. And, since Alpha Xi Delta’s founding, our two organizations have coexisted, or currently coexist, on 109 campuses. Could Alpha Xi Delta have become a thriving organization without receiving help from the members of Sigma Nu? Given the strength and fortitude of their 10 Founders, the probability is quite high. Regardless, the next time you talk with an Alpha Xi Delta friend, or meet one of their sisters for the first time, tell her how proud you are that Sigma Nus at Lombard College were able to extend a helping hand. This version of the article originally appeared in the Summer 2007 issue of The Delta. Juan-Paulo Varela (UC Davis), co-founder of the Crisol Latin American Film Initiative. Founded to increase the appreciation of Latin American arts and culture, the Crisol Latin American Film Initiative will offer Spanish language cinema and a variety of artistic mediums that highlight the similarities between Latinos and their non-Latino peers. The Film Initiative, co-founded by Brother Juan-Paulo Varela (UC Davis), will host its inaugural run over four weekends beginning Saturday, March 14 through Friday, April 3, 2015. All screenings will be held in Salt Lake City, Utah. 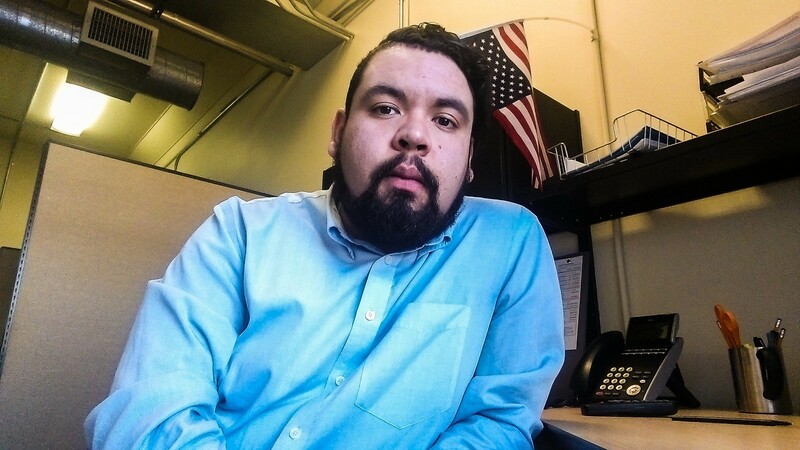 Varela serves as the program director, while co-founder Karem Orrego, a fourth year film student at the University of Utah, serves as executive director. When asked why he co-founded the Film Initiative, Varela said he wanted to create a platform through which Latin American arts and culture could be both appreciated and critically examined in the context of shifting demographics in the United States. “Crisol is an olive branch similar to the fraternal love that we as Sigma Nus experience–we want to extinguish tired stereotypes and elucidate a modern Latin America in juxtaposition with the United States,” he said. The Crisol Film Initiative is expected to attract an audience of more than 1,200 people over its first four weekends and an additional 600 during its second screenings in late April. Such prominent attendees for the opening reception will include University of Utah administrators, including the dean and several department chairs of the College of Fine Arts. Likewise, Utah State Senator Luz Escamilla and Utah State Representative Angela Romero will attend the closing reception along with leading members of Salt Lake’s arts and culture community at the Urban Arts Gallery in downtown Salt Lake. Founded to increase the appreciation of Latin American arts and culture, Crisol will offer Spanish language cinema and a variety of artistic mediums that highlight the similarities between Latinos and their non-Latino peers. 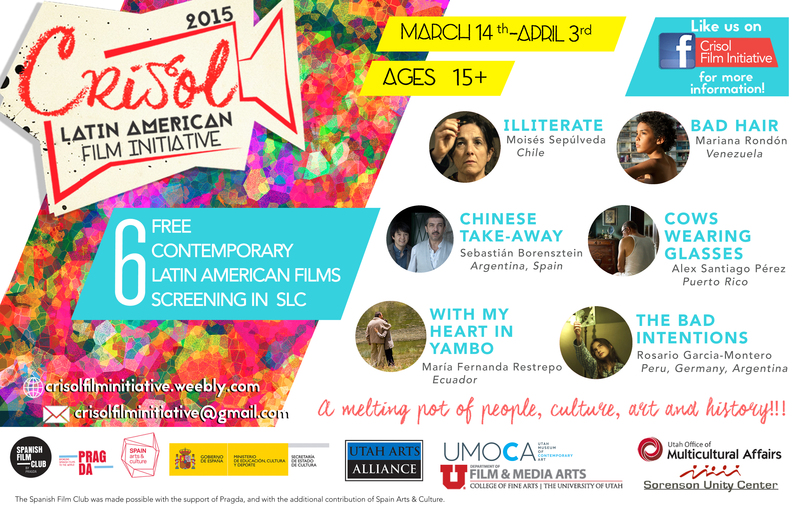 To accomplish Crisol’s mission, Varela has actively engaged both leading individuals and organizations within Salt Lake’s political, artistic, and cultural spheres over the past six months. The Sundance Film Festival, held in Salt Lake City, helps create a receptive attitude towards artistic endeavors but also creates a competitive market for funding and recognition. 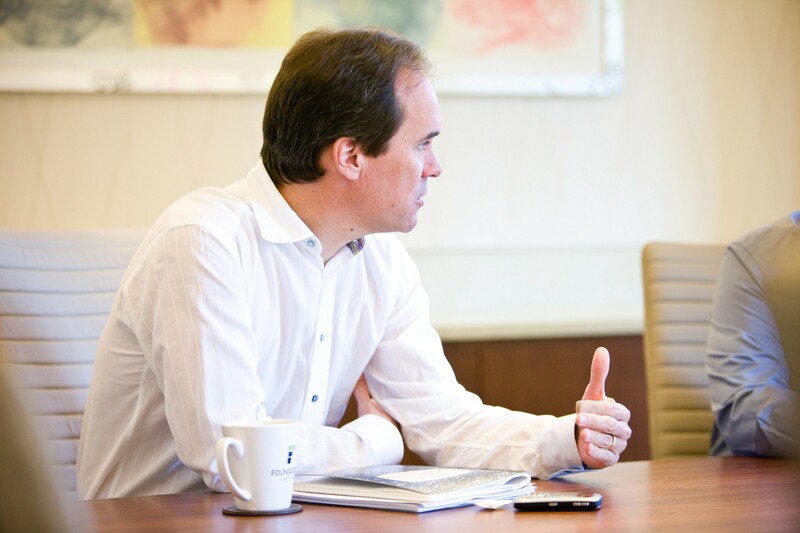 As such, Varela and the team at Crisol have worked diligently to gain the necessary support to make Crisol a reality. Following a successful inaugural run, Varela hopes to continue the Crisol Film Initiative as an annual event. Alternatively, the team at Crisol is weighing offers from two of the leading arts festivals in Utah to merge Crisol with their events. In either case, Varela is excited with his opportunity to promote the arts and enhance the quality of life in Utah through the production of the Crisol Latin American Film Initiative. Recently used Sundance Film Festival venues will play host to film screenings as well interactive art performances in partnership with the University of Utah’s prestigious Ballet School. Second screenings will take place in the weeks after the Initiative’s closing reception at the Sorenson Unity Center. The first film will be screened on Saturday, March 14th at 7:00 p.m. at the Post Theater on the University of Utah’s campus. For more information, visit the Initiative’s website and Facebook page. Brother Al Rodriguez’s (Case Western) band The Midnight Slander has released its debut music video. The Midnight Slander, which formed just over two years ago, features Rodriguez on bass, Mike Gray on the drums and keyboard and Dave Conner on guitar and lead vocals. One of the band’s signature elements is Gray who plays both drums and keyboard during live shows. Rodriguez informed us that the band was signed to Spectra Records in 2013. The new video for “The Long Way Home” is a collection of live footage and shots of the band while on tour.